Cutout flybridge for Bow access? Has anyone ever seen this or thought of doing it themselves? I've seen plenty of transom door DIY setups but couldn't find anything about modifying the flybridge. Reasons you might want to. Who doesn't want another way to move about? I did a silly drawing of what I was thinking on my Mainship 34 but its basically cut out a 2' section or so, add folding steps(so you can see while at lower helm) and finish it all out. I was also thinking that you could easily add a door or a cutout for a doggy door. My specific reason is my 80lb Golden Retriever can't get up the ladder, loves being around us and means the world to me(our daughter). Doubt i'd ever do it but while bored I thought why not. But the Willard’s have a step ladder so you can step right down to the forecabintop. I think some older Island Gypsy's had a similar arrangement at the center of the flybridge. I think it was a 40 something footer. you might try a google search for some pictures. I’ve seen a few boats like that from the factory. I like the idea. I think the trickiest part would be the steps; as part of the goal would be allowing doggy access, actual steps would be needed rather than a section of ladder. Since you would want them to be out of the way when down below, they would need some really clever design and fabrication to allow them to be "flip down." Alternatively, they'd just be something that stowed up above and was set into place when the door was opened. Support of the starboard side wall of the flying bridge is a good question. Bracing in the form of stainless tubing could be added. A radar arch could even be installed that served to tie the side walls to the cabin roof. Of course, depending upon the construction of that wall, it might be fine without additional reinforcement. In such a case, more thought would have to be put into the door hardware to ensure that it prevented against spreading of the opening when the door was closed. Obviously, it would be easiest to execute the idea if the door were placed 'midships. Good idea, but I think it would maybe be a bit ungainly even under the best case. Not sure what you'd do for handhold/railing. By memory I think the flybridge would hold together OK with a gap. There's lots of support for the sides as it's a big single molding for the seats and side. I have a buddy who had a Willard 40 and it was a great feature for single handling. I would consult a really good yard before modifying a boat to do that. On my old Hatteras, it would have had no structural impact, but a bunch of impact on the lower helm visibility. Plus, we had real stairs from FB to aft deck so I could scamper quick if poor planning drove me to it. Which it did, once. I cant think of a reason it couldn't be done & be made to look nice. On you're particular boat the port side would be better because the wiring, shift cables & steering hoses are on the starboard side. I say go for it & if it turns out nice, I'll copy your design! You had better support the front glass panels those boats are very weak on that area. I tend to agree. If there is a non-flybridge version of the boat, I’d want to look at it to see what (if any) differences there might be in roof construction. 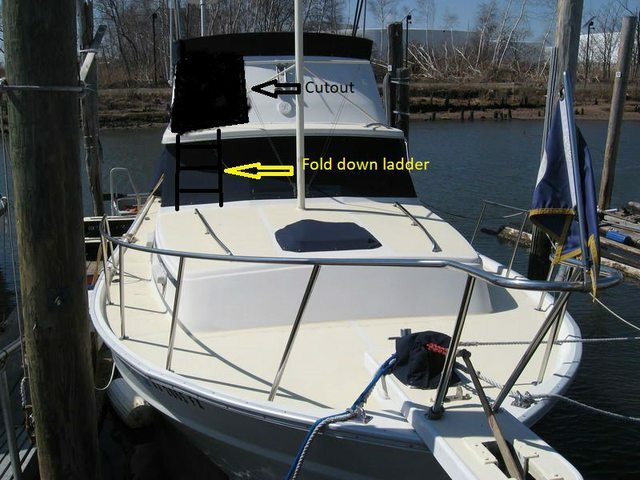 This is my kind of project as I’m always cutting, chopping or altering my boat in some way, but I want to make sure that the boat will end up with the original strength/flex characteristics. Cracks in corners or joints might be a sign that a bit more glass in that area could help. A rigid subframe might be in order for such a project. Careful of just loading on weight up there. Lightweight and strong are both possible. Calculate costs and double it. Sounds like a very interesting and and beneficial project, done right. The '80s Island Gypsy 44 sedans have that. Good railings and all. Additionally, the flybridge helm position is above and aft of the seating. Old enough to not be so expensive to buy. Big enough. Huge engines. I liked one of the two we saw but my wife thought it was way too much boat. No doubt all associated costs would be far higher. Several of the "non-trawler" Mainship models after yours did something like that. We had big dogs, same issue. I've thought if we still had out Mk III I ight investigate replacing the ladder with some kind of circular staircase... if viable. If you wanted access solely for your dog to be able to access the front deck it would be easier to cut an access panel out in the front of the bridge. Maybe hinge it on the top. Way simpler than having to re engineer the whole thing. A doggy door! That could be really easy and not spoil the look. Good thinking. I like the idea, so many boats lack safe access to the foredeck. It could be constructed with the steps built into the backside of a fold down panel and an offset hinge to get it over the eyebrow. I’m envisioning something similar for the transom door to double as a boarding ladder. 40' Shuckers had that setup.